When fall begins to assert itself, we love nothing more than a comforting dish like Toad in the Hole. We made some last week, just as the weather started to cool. Don’t worry. No toads were harmed in the making of this meal. 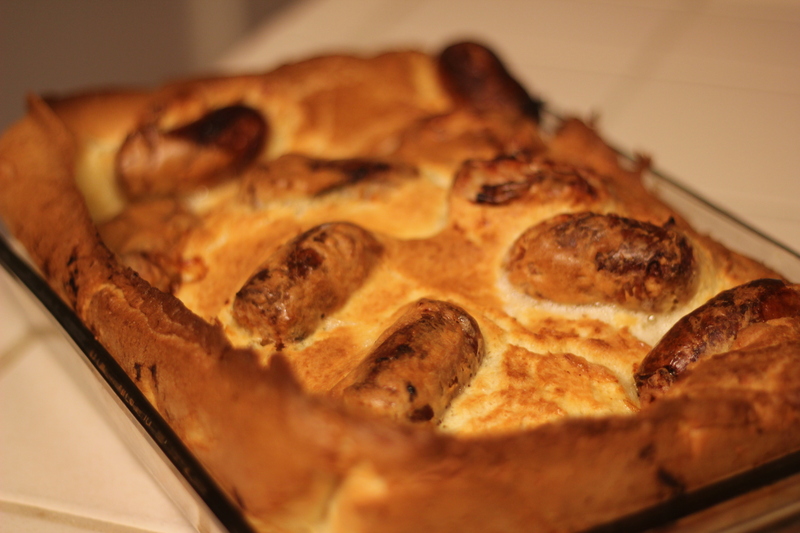 The origins of Toad in the Hole are here. Whisk the milk, eggs and salt well and let stand for 15 minutes, then whisk in the flour and let stand again until you need it. Cook at 450 degrees. Put the muffin tin in the oven to heat up for a good 10-15 minutes, with vegetable oil at the bottom. Add British bangers (we cut ours in half). When the pan and oil has been heated, pour in the yorkshire pudding batter and cook for 15-20 minutes or until they have puffed up gloriously.